NationalBLS is the first national listing service of pre-approved residential real estate buyers. 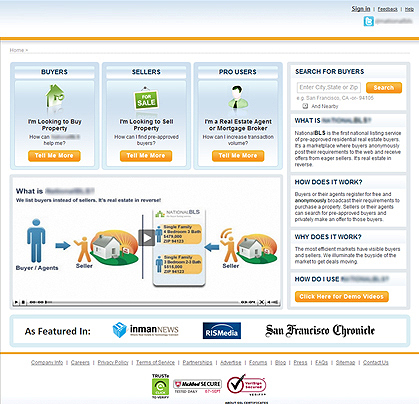 It's a marketplace where buyers anonymously post their requirements to the web and receive offers from eager sellers. It's real estate in reverse. 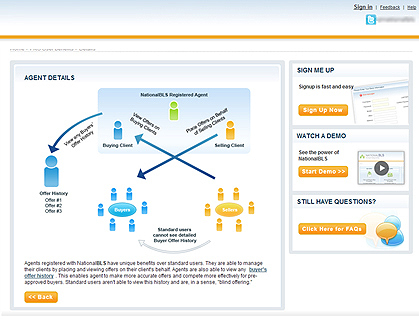 Buyers or their agents register for free and anonymously broadcast their requirements to purchase a property. Sellers or their agents can search for pre-approved buyers and privately make an offer to those buyers. Reduce Overheads for the buying and selling of the property. The website provides an idea of processes involve in selling and buying of a property. 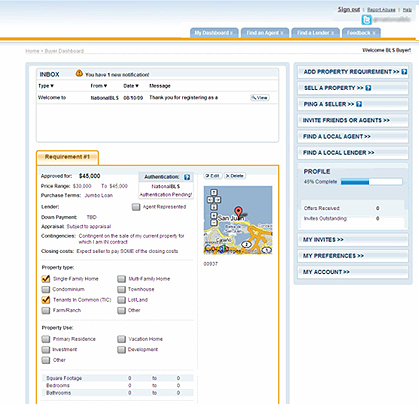 User can list the property for the sale or they can search for the purchase. A) Home Page: A visitor to the site can check the benefit pages which explain the benefits of a buyer, seller and a pro user besides checking the demo videos for different role and purposes. 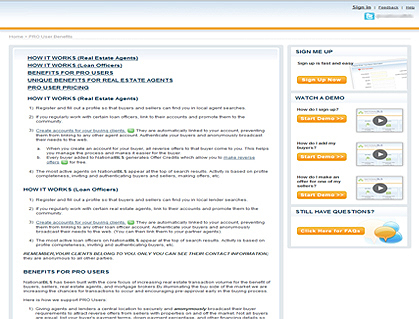 A visitor can perform search of buyers with their requirements from this page. Once a user is a registered member, user can make purchases/transactions on the site as per the role on the system. Agent can have one or many buying clients and selling clients and can work on their requirements or properties on their behalf. Agent can receive offer credits by inviting buyers, agents and lenders through referral system and can utilize the credit amount for making offers on behalf of their selling clients. A buyer can add as many requirements as he wants once he joins the system, in which he can mention his budget, preferred location along with other preferences. Buyer receives offers from the seller and can accept, reject or can put the offer on hold. A buyer also has an option of selling his property, so he can also be a seller. 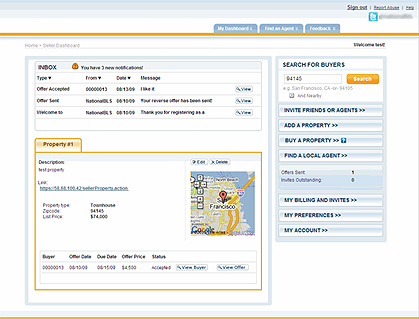 A seller can add number of properties in the system and search for a buyer in his zip code or any other location. If seller finds that the buyer requirements matches with his property he can make offer to the buyer for his property. The bidding process goes on unless and until buyer accepts or rejects the offer. A lender can have number of buying clients and he can perform add/edit functions for his client requirements. However, a lender can't work on his selling clients' properties nor he can make any offers. A lender can authenticate a buyer's budget amount like an agent. Agents registered with NationalBLS have unique benefits over standard users. They are able to manage their clients by placing and viewing offers on their client's behalf. 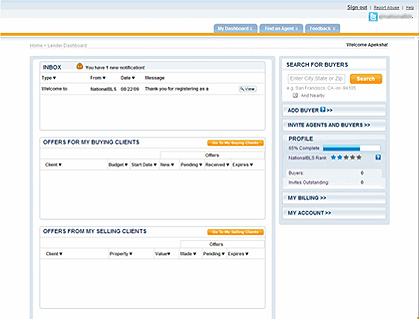 Agents are also able to view any buyer's offer history. This enables agent to make more accurate offers and compete more effectively for pre-approved buyers. Standard users aren't able to view this history and are, in a sense, "blind offering."